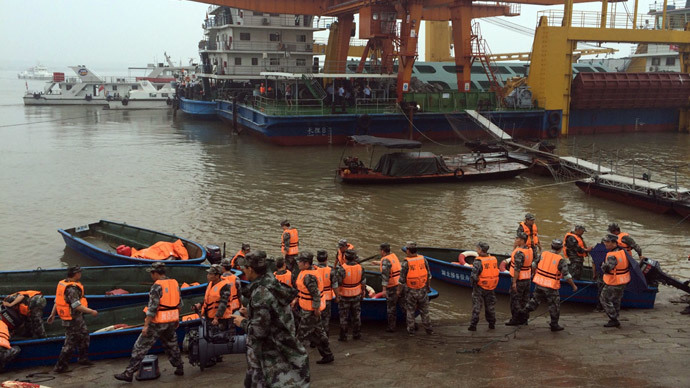 A ship carrying more than 400 people and some 50 crew members from the eastern Chinese Jiangsu province to the southwestern city of Chongqing has sunk in the Yangtze River, according to local officials. Only 13 people are said to have been rescued so far. The vessel sank Monday night in the Jianli County, Hubei Province, according to the Yangtze River Navigation Administration cited by Xinhua. The ship, named Dongfangzhixing (Eastern Star), was heading to Chongqing from the city of Nanjing, the capital of Jiangsu Province. The boat was carrying 405 passengers, five travel agency workers and 47 crew members at the time of the accident, the agency reported.According to CCTV, the captain and chief engineer of the ship are now in police custody. Rescue operations began during the night. Five individuals, whose bodies were recovered, have been confirmed dead. The Ministry of Transport said 13 people have been saved so far.Among the survivors in Jianli, Hubei, is an 65-year-old woman. According to Dongfangzhixing’s captain and chief engineer, who were among the rescued, the ship abruptly sank after being hit by a cyclone. Both have been detained by police for questioning, Xinhua news agency reported. Transportation ministry official now in Jianli said they are considering using 5 crane-like devices to life entire ship from Yangtze. Strong wind and heavy rain are still hampering the rescue work. Chinese President Xi Jinping has ordered that rescue efforts be intensified in the wake of the disaster. The search and rescue operation is being headed by Premier Li Keqiang, who has left for the scene with other senior officials. Reports in Chinese media suggest that some passengers are trapped inside the capsized boat but still alive. CCTV News said on its Twitter that “sounds can be heard from inside” the ship.